Ok, lets say this is a 2 dimensional representation of your cone; note this is not to scale. 26� wide at it�s base. 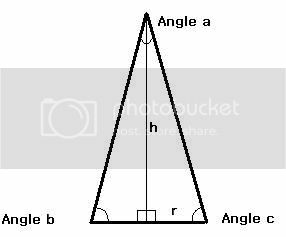 The angles of a base of a cone triangle will be the same, so as we know the angle of the Apex (Angle a) we can determine the two base angles easily. So basically, the base of the cone would only be 3.94� when it reached the doorway which is 18� away from Sirene. Sorry, to bore you all, I know your eyes have glazed over by now. It is the Engineer in me. So, now we can say, the Magic overcomes the Trigonometry and the result is exactly as Tann described. I mean after all, the DM is always right, right? Posted on 2013-08-26 at 23:30:04. So my calculations were wrong ok got that However was the cone smaller then or bigger then I thought it was? And would it have hit the wall on the sides of the door then Ulthok without my 'magical push"
Posted on 2013-08-26 at 23:46:23. Oh, oops. He nearly died... my bad. That's why I kept the recap: for my own forgetfulness. Posted on 2013-08-26 at 23:51:20. And he died later on but Cor prayed and was granted a very high lvl god like healing spell that saved Conall at that time. I think the only player left from that time is Kyle and up until last week Brianna. Posted on 2013-08-26 at 23:55:06. If Trigonometry works in your Fantasy world, the cone of cold would have been only about 4' wide when it reached the doorway. If the doorway is 14' wide it would not have hit the walls beside the doorway and would not have 'splashed' back into the hallway. See, that is why I didnt want to say anything but you insisted. Posted on 2013-08-26 at 23:55:36. Next time we have something like this possibility of area effect or large area spells catching the party. I'll check with you at those times to be sure I'm calculating things correctly. Deal? Posted on 2013-08-27 at 00:11:11. Conall Glendower of the House Glendower fought well with only one leg. He did lean to the left for a few days. Then he died, but he got better. Posted on 2013-08-27 at 02:25:27. Well gang this isn't a simple game. As Tann has said you are HUGE POWERFUL characters for a game with HUGE POWER Enemies. We are in this together so we can share ideas to survive. Does stratgy and tactics look so bad now? So now we'll heal and fight on, just RP the feelings. Posted on 2013-08-27 at 02:39:52. SilentOne and I are working on a coordinated post, so it may be a couple more days before ours is up. I've sent her a reaction from Ulthok to his situation which I may be able to post then add followup to what SilentOne writes. My next section depends on her reaction. I'd guess we need to organized quickly, it almost seems like a shift change for the badies as first the Orcs emerged and then the Goblins. That still leave what is behind door number three to join the fun and we are quite done with the Goblins. 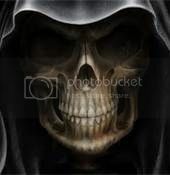 Posted on 2013-08-28 at 12:34:59.
sorry! been out with a cold/fly hybrid for a few days.. I'll get a reply to you hopefully either tonight or tomorrow Ody! Posted on 2013-08-28 at 22:29:37. Posted on 2013-08-29 at 03:02:19. Posted on 2013-08-29 at 03:47:42. I posted what I had sent to SilentOne (with some edit corrections), but seeing she is not well and may take a bit to be up to posting I thought it might help others prepare their posts. It only involves Ulthok and Peri so it won't effect other posts. If anyone tries to speak with Ulthok he will have to communicate through Peri. Posted on 2013-08-29 at 18:53:11. Ok I along with Hammer was informed by Archangel by PM that he would be leaving the Inn and both of our games due to an extended real life lack of internet. He hopes to return and if I have an opening to play in Trilogy again. So for now we have two NPC's that I will be running unless any of you know of a male Innmate that would be interested in taking over Lothor or Barreel. Still looking for a few posts before I start writing mine so if you have not posted yet please do. Posted on 2013-08-30 at 21:32:42. With the heal from Rayne how quickly will Ulthok get back his sight and how many HP return? I had figured that with him wearing the gantlets only his face was exposed. Posted on 2013-08-31 at 14:28:42.